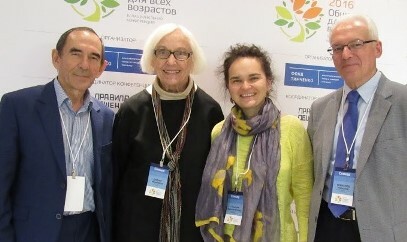 Pass It On Network’s liaisons who presented at the “Culture of Ageing” Conference: (from left to right) Afruz Minnigaleeva, Jan Hively, Gulnara Minnigaleeva, and Vsevolod Rozanov. Jan Hively, co-founder of the Pass It On Network, speaking about “What’s next for all of us?” and “Changing Expectations for Aging.” Nina Koryakina (right), a Russian translator who teaches English as a second language. Elderly residents in rural areas are often isolated, with sparse services, lacking support from their children and grandchildren who live in the cities. 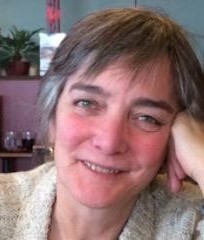 There is a substantial gap between the traditions and values of the World War II generation and those who are now coming into retirement age, but all of the older adults from midlife on still face ageist policies and practices that focus on frailty and dependency rather than on the strengths and productivity of older adults. Three of the Pass It On Network Country Liaisons were among those who spoke about changing the culture of ageing through creative programs that encourage older adults’ to share their strengths and help themselves and others. Gulnara Minnigaleeva, a Moscow-based researcher at the Center for Civil Society and faculty at the National Research University’s School of Higher Economics, moderated a panel discussion about opportunities for independence and self-development in old age. Vsevolod Rozanov, an MD and professor of Clinical Psychology at the Odessa National University in Ukraine, spoke about encouraging positive aging through lifelong learning, including retraining for older workers who have lost their jobs. Jan Hively, the co-founder and U.S. liaison for the Pass It On Network, came from the U.S. to speak about “What’s next for all of us?” “Changing Expectations for Aging.” Jan’s powerpoint presentation was translated from English to Russian and shown on the screen, while her spoken words were interpreted in Russian by a translator by her side. This was Jan’s first trip to Moscow, following the tracks of Pass It On’s other co-founder, Moira Allan, who had spoken at the third Timchenko Foundation conference a year ago. Jan says: “It was wonderful to meet Vsevolod in person and to stay with Gulnara’s family in her new home northwest of Moscow. I was warmly welcomed by the Timchenko Foundation’s staff and volunteers. 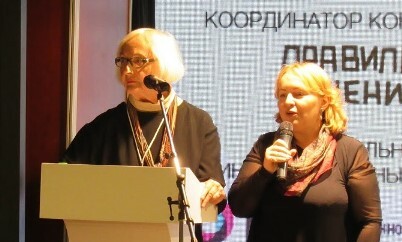 “One high point for me was the presentation made by Gulnara’s father, Afruz Minnigaleeva, about the wealth of programs offered by and for older adults through the non-profit program, Moi Goda – Moe Bogatsvo (‘Wisdom Ripening’ in English) in the Minnigaleeva family’s home city of Tuymazy, in Bashkortastan, 24 hours east of Moscow by train. Gulnara helped start the program in 2007 that has been coordinated first by her mother and sister and now by her father. It’s a model for advocacy leaders for positive aging everywhere. Without money but with space donated by the local university, older adults have created a growing cluster of programs for lifelong learning, wellness, crafts, life planning, meaningful work, TV and theater production, dance, travel, dating, etc. The powerpoint presentation from Vsevolod is being translated into English, and will soon be posted on the Pass It On website. View Jan’s presentation here and Afruz Minnegaleva’s Wisdom Ripening presentation here. Pass It On’s Country Liaisons, Dr Hans Kristjan Gudmundsson (below) and Amoorgum Parsuramen, from Mauritius, attended the Third Age University conference in Osaka in October. It was the 7th U3A Asia Pacific Alliance International Conference and the 99th AIUTA Governing Board Meeting and International Conference. The theme was “U3As Linking the World” with sub themes on Active & Healthy Ageing and Intergenerational Cooperation. Dr Gudmundsson presented the work of the relatively new U3A in Reykjavik that has attracted a great deal of interest. Among the world’s nations, older generations are growing in proportion to the younger ones, unfortunately often described as a growing burden on societies. The older generations should rather be considered an asset to society. The latter part of life, the “Golden Years of Adulthood”, is the age when individuals normally have fewer responsibilities, good physical and psychological health, and easy access to a life filled with purposeful engagement and activities. Their experience and knowledge is important for the progress and productivity of society. Citizens and societies should be equally aware that it is crucial to prepare actively for these latter years of life. In this regard, new and radical thinking is essential. 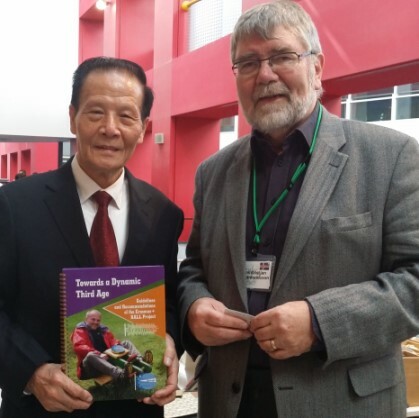 Mr. Qicon Yang, President of the Jingdezhen older university, one of China’s 60,000 universities for the third age, received a hard copy of the Be Active through Lifelong Learning projects recommendations from Dr Hans Kristjan Gudmundson in Osaka. Two years ago U3A Reykjavik, Iceland, defined and initiated the BALL-project (Be Active through Lifelong Learning) to investigate how best to plan and implement preparations for an active latter part of life, the third age. The project was supported by the European Union’s Erasmus+ programme, and carried out in cooperation with U3A organisations in Lublin, Poland (LUTW) and Alicante, Spain (UPUA), managed by the Icelandic company Evris. The age group in focus was the so-called “baby boomer” generation, 50-70 years of age. The research results, now published (see www.ball-project.eu), are presented as guidelines and recommendations to all stakeholders, public or private, that have obligations and interests in offering advice to prepare for the third age. The recommendations are defined in three actions, each being independently applicable, while interlinked to form a complete package for best results. These are: Awareness Raising, Personal Development Academy and The Warehouse of Opportunities for the Third Age. The Pass It On Network partnered with The World Café to convene a Wiser Together Café at the 8th International Positive Aging Conference on August 26 in Washington, D.C. Shepherded by the co-founders of The World Café, Juanita Brown and David Isaacs, forty older and younger leaders talked about partnering across generations for the Common Good. In the Harvest Report that may be viewed here, you will find a stunningly attractive summary of the specific questions that were asked and the themes and recommendations that were discussed. You will see photos showing the conversation process, plus not-to-be-missed drawings by Stephanie Brown, the graphic designer who illustrated process and findings. The 9th Positive Aging Conference will be held in 2018 in Colorado – again in partnership with CSA (Certified Senior Advisors). In the meantime, The World Café and the Pass It On Network are planning to convene a virtual Wiser Together Café for Fall 2017 (probably in September) to expand on the exciting ideas generated last August. If you are interested in participating, all you have to do is to connect via computer or smart phone. Click here or follow the instructions in the Harvest Report to join the Wiser Together Café e-mail list and be informed when specific plans for the virtual café are developed. Dana says that one unique way to help seniors feel great about themselves is via memory training. Listen to the recording of the interview here and pick up some tips for yourself. The International Institute on Aging United Nations (INIA), based in Malta, is increasingly active in training people around the world. Their goal is to work to empower countries with economies in transition to cope with the multiple challenges of aging populations. 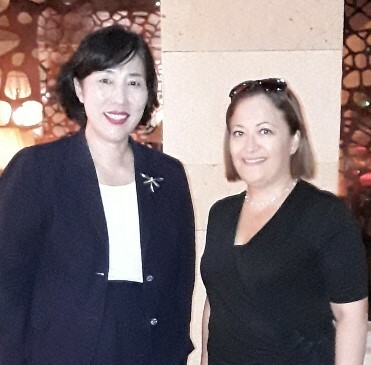 INIA’s Research and Program Manager, Rosette Farrugia-Bonello (right) with Prof Dong Hee Han, Director of the Research Institute of Science for the Better Living of the Elderly in Busan, Seoul. 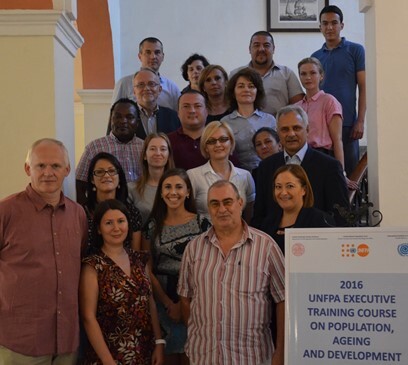 An executive training course in Malta on Population, Aging and Development in conjunction with UNFPA and the Charles University, Prague Czech Republic. Currently, The FreeBird Club has listings in over 17 countries across all continents and is growing daily. 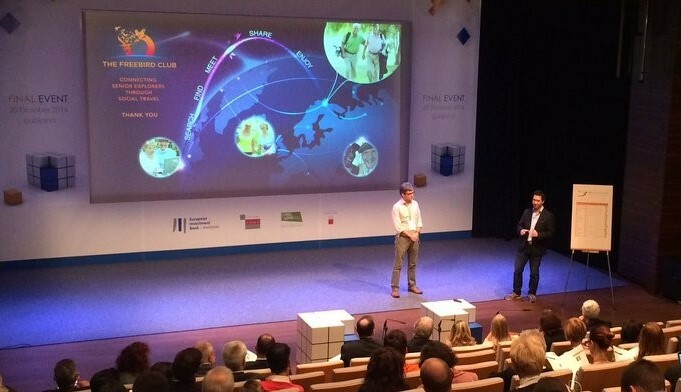 Marie continues, “Since we showcased our plans in San Francisco, won honors at the London Ageing 2.0 Global Conference, and presented our concept at the European Investment Bank finals in Slovenia, we are thrilled with the response and interest in our activities worldwide. “Many thanks to all our “Pass in On Network” supporters and various country liaisons for the warm welcome and ongoing encouragement. We really are most grateful for all offers of “opening doors” and “sharing information”. Please contact us if you would like to know more about our travel & home stay programme – always happy to have a chat with new friends! Make sure you mention the Pass it on Network when you contact us. Thinking about going to a New Home….or Staying Home? Most older adults say that they want to remain in their homes as long as possible – to “age in place” as it’s called — rather than to move somewhere else. Here are two articles about housing choices – both an overview of senior housing trends from Europe and stories about two programs for sharing housing from the U.S.
Before you read the articles, tell us what housing choice you are thinking about for yourself. A – Stay where you are? If Yes.. What’s the most important thing that will be needed to help you stay where you are? Please complete our survey form here. We’ll report back on your responses. Here’s an excerpt from a relevant article by Dirk Jarré, President of the European Federation of Older Persons (EURAG), a Pass It On Network Partner. We all need to be involved in creating and safeguarding desirable housing choices for the future. The growing emphasis on meeting unique individual needs for housing is matched by the impressive options created by science and technology. Totally new public and private responses are available to match the varying support needs and choices of the individual, thus eliminating inappropriate ‘one-size-fits-all’ approaches. They can effectively address the desire of people to receive personalized and flexible care that is tailored to their specific needs and respects them as unique individuals. At the same time, they can empower the older person to understand that he or she is still functioning, and maintaining the personal skills and social abilities that enable them to go on ageing in place. One of the most important principles for successfully tackling the challenges of an ageing society is that older persons must be directly involved themselves. So far, this principle has been mostly neglected or underdeveloped. Direct involvement of older persons themselves: a) starts with the conceptual phase of planning for goods, services and processes; b) goes through production and implementation or marketing steps; and c) finally reaches the monitoring, evaluating and readjusting process. We are at the doorstep of a brand new form of society. We have the enormous opportunity and responsibility to shape its future through wisely orienting its technical, ethical, cultural and economic developments by benefitting from the available options and by making the right choices for today’s populations, as well as for generations still to come. The groundwork for the required strategies and actions has been achieved by the Second World Assembly on Ageing of the United Nations that took place in Madrid in April 2002. It adopted the “Madrid International Plan of Action on Ageing” (MIPAA) – a comprehensive strategic document with some 130 concerns, concepts and action points, all addressing the changes and the needs of ageing societies and older persons worldwide. 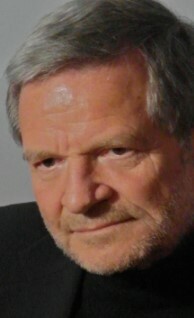 This was followed by a European “Regional Implementation Strategy” (RIS) by which the 56 member states of the United Nations Economic Commission for Europe, UNECE, committed themselves to implement the UN “International Action Plan on Ageing” through a total of 100 specific action points regrouped in 10 chapters. More concrete commitments of the UNECE member states are made in regional “Ministerial Conferences on Ageing” that take place every 5 years. Local cities and towns are best able to work with their residents on housing and services and other aspects of community infrastructure that support positive ageing. Hundreds of cities and smaller communities are members of the World Health Organization’s Age-Friendly Cities and Communities Network. And the European Union sponsors a “European Ambient Assisted Living” program with partners in 23 countries. Read full article here. Have you thought about home sharing? If so, think about compatibility. 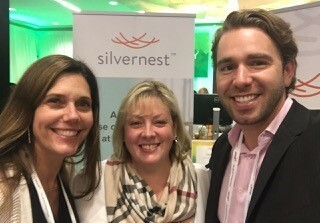 Kari Henley (left), Margaret Ann Burness and Chase Terwilliger, from Silvernest, a home sharing platform for older adults seeking compatible housemates. Kari Henley is a volunteer with the Pass it On Network. She facilitates our quarterly virtual conferences with country liaisons from around the globe. Kari has a new job, working for a new company serving a new trend – home sharing for older adults. Silvernest is an online platform for older adults who for whatever reason – divorced, empty nesters, retired, widowed, or long time singles wanting to monetize an extra bedroom – decide that it makes sense to share and seek a compatible housemate. This innovative award winning company recently walked off with the first runner-up prize at the esteemed Aging2.0 global start-up competition. Congratulations to Silvernest, Kari and the team! “Oh yes, living alone is not the best,” Moira said to me when we met at the Positive Aging conference in August. Moira lives on the Left Bank in Paris. Her apartment is on the top floor of a six-floor building. When she steps out on the south terrace she has a view of Napoleon’s Tomb, when… Read complete interview with Sharing Housing founder, Annamarie Pluhar (left) and Moira Allan, Pass It On Network’s co-founder and international coordinator. Model United Nations (Model UN) programs engage high school and college students around the world in discussions about international issues that simulate the proceedings of a United Nations assembly. Participants research and represent specific issues faced by assigned countries and formulate policies that they then debate and vote on. The students learn about diplomacy, public speaking, and parliamentary process as well as about the topic being discussed. On October 15, in the first-known Intergenerational Model UN, Pass It On’s co-founder, Jan Hively, was paired with a high school student to represent Sierra Leone in a discussion about Water Issues. Twenty local seniors paired with 20 regional high school students to represent 20 countries. The Intergenerational Model UN was sponsored by Age Friendly Yarmouth (on Cape Cod, Massachusetts), a member of the World Health Organization’s Age Friendly Communities network. The program was led by Caitlin Moore, education director with the regional UN Association, working with Kathleen Bailey, town director for aging services, and local volunteers, including Jan, who are committed to show that “Age Friendly” means friendly for ALL ages… not just for older adults. Program locations around the world are shown on the Model United Nations website here. Think about introducing an intergenerational version where you live. When Social Services Are Broken. How We Can Fix Them? Hilary Cottam Believes Relationships Are the Key. When a family falls into crisis — and it sometimes happens, thanks to unemployment, drugs, bad relationships and bad luck — the social services system is supposed to step in and help them get back on track. As Hilary Cottam shows, in the UK a typical family in crisis can be eligible for services from more than 70 different agencies, but it’s unlikely that any one of them can really make a difference. Cottam, a social worker herself, asks us to think about the ways we solve deep and complex social problems. How can we build supportive, enthusiastic relationships between those in need and those that provide help? She finds people say “We do not want to be needy, with ‘things’ being done to us; we want to contribute and participate. Nor do we want to be atomized consumers, being told that it’s our responsibility to ‘get it.’” People want to be socially connected and make a contribution. There is no magic age when your attitude and treatment of people should change. The Peterborough Council on Aging, Ontario, Canada, partnered with Brand Health to develop a marketing campaign that aimed to change people’s thinking about aging and how we often have a negative impression of people once they reach a certain age, such as 60, 65 or older. The theme of this year’s International Day of Older Persons at the United Nations (UNIDOP) was “Take a Stand Against Ageism.” Ashton Applewhite was invited to give the keynote. On the video recording, her talk, “Confront Ageism – Or the Rest Is Noise,” begins at 28:18. Speakers from the World Health Organization and HelpAge International, and the Ambassador from Singapore, are worth listening to as well. View video here.